Super Coach Express is a bus operator which was established on July 2007. The company is based in Pontian, Johor. The transportation services that offered by this company include bus express service, airport transfer service and van rental service. The bus fleets of this company consist of mainly single deck buses. There are two types of single deck buses offered by them which equipped with either 27 seats and 30 seats. The company is using “2+1” seating arrangement for their buses. The large comfortable seat coupled with the spacious interior within the bus coach promotes comfort especially for long distance rides. 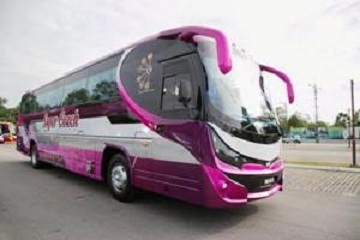 The colors used by Super Coach Express are pleasant which brings a sense of comfort and ease of mind for travelers. 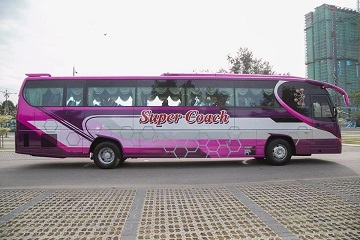 Super Coach Express offers bus routes departing from TBS (Terminal Bersepadu Selatan) to Skudai and Yong Peng. In additions, the company is also providing bus trips from Tun Aminah to TBS (Terminal Bersepadu Selatan). Among the bus routes offered by the company, the bus routes from Johor Bahru Larkin Terminal to TBS (Terminal Bersepadu Selatan) and its return routes are the most popular ones. Check the bus routes and fares at Easybook.com. Let’s kick start your journey with Super Coach Express! Book it now!